As energetic beings, Reiki is a simple and pleasant way to bring calming and loving touch to yourself, your friends and family members, and eventually to your clients. It is used in classrooms, nursing homes, hospitals, and anywhere healing energy can possibly be needed. Reiki 1 offers techniques for self care, and care of friends and family. The chair protocol is taught whereby you can work on others in a sitting position. In Reiki 1 you also will learn how to quiet your mind, clear your energy and begin your meditation practice. This is a two day class of 10 hours of study, and then you must complete 30 additional practice hours to become certified. 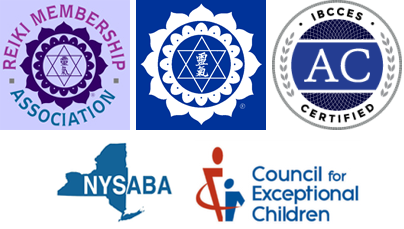 This certification is required for attending Reiki 2. Reiki 2 teaches you to transmit your healing energy to others at a distance and how to use Japanese Reiki Symbols in your practice. It also digs deeper into how to meditate, transmit energy from afar, and work with clients on a massage table. Again, it is 10 hours of class time and 30 documented additional hours for certification. Reiki Master level is the third level and is not being taught this fall. This is a 100 hour course of several weekends and home practice. Stay tuned for details about that! Cost: Each level is $450 for one person, bring a friend and it’s two for $800. Include name, phone, and email address if mailing a check. Limit is 10 participants. You will receive a confirmation email that your attendance is accepted. If we are over the limit, your fee will be refunded.